The apartments in The Natick Mills have wall to wall carpeting. 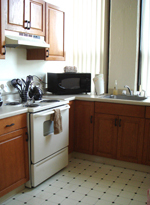 Each kitchen includes a frost free refrigerator, electric stove and garbage disposal. All units are fully equipped with sprinklers, heat and smoke detectors. Heat to the apartment is included in the rent. Some recently renovated units have Corian® countertops. Each unit has large oversized windows. 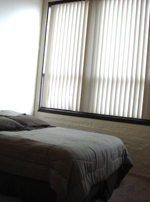 All windows have vertical blinds. Units have high ceilings with exposed concrete beams, and pipes. Most have exposed brick. Laundry room has brand new, coin operated Speed Queen washers and dryers. All units are wired for broadband cable and internet. Pets are currently not allowed in the units. There are no fees for rental of the units.